So Sam made it through the night with only a few brady’s! The nurses and doctors are now rethinking re-intubating him. Things may change overnight, but for now, Sam stays on the SiPAP machine. Personally, i think his stubborn streak kicked in. As anyone who knows me knows, i don’t like being told I can’t do something. I find it inspiring to not only do it, but do it well. I think Sam heard he couldn’t handle being of the vent and thought to himself… “oh hell no!”. I guess he got my stubborn streak. Before heading to the hospital to see Sam, we did a normal thing… went to watch Irene’s soccer practice. It was really nice to all be out as a family doing something not related to a hospital, the NICU, pumping, etc. It was a really nice morning, and I think for Irene it was especially nice. Her first taste of normalcy in 2 weeks. After practice, we took Irene to my parents house. Since we are just finally getting some summer weather here, my parents offered to take Irene swimming- allowing both Peter and I to go to the hospital to see Sam. We got there around 2 and he was looking really good. I had to pump before I could hold him, so off I went. Much to my surprise, I have now filled the 3 medium sized bins I am allowed to have and have been told I can’t bring more milk to the hospital until they ask me to. This means our freezer needs to be cleared out cause the milk factory is moving in! 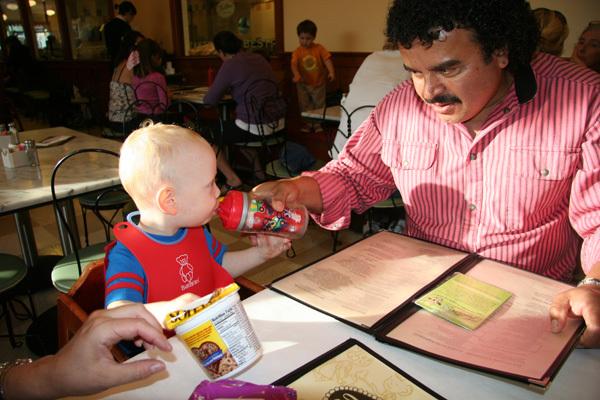 I need to remember to ask how many moms get banned from bringing milk after just 9 days. I have to assume this is not a common occurrence. Hopefully the ban will be lifted soon. They did up Sam’s intake overnight from 3MLs ever 3 hours to 4 MLs every 3 hours. With the new GI tube, he is tolerating his feeds better. 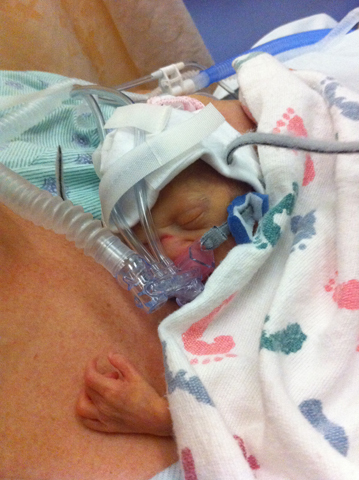 For those wondering, Sam lost about 11 ozs after he was born, taking him down to 1 lb 1 oz. 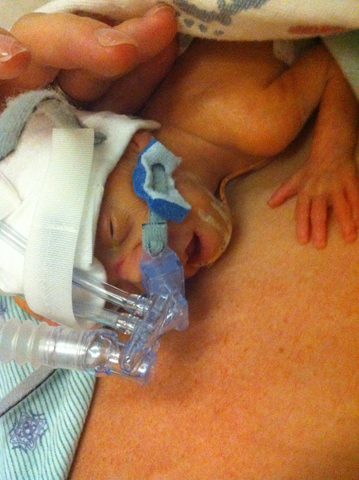 As of Friday morning, he was back up to 1 lb 6.5 ozs and gaining. 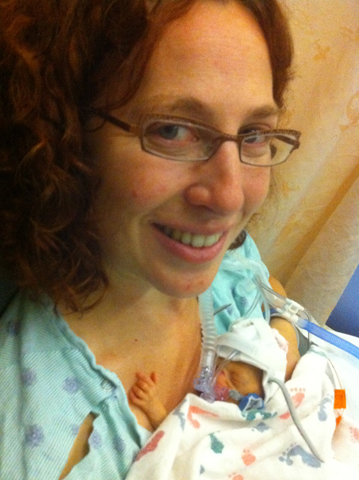 After pumping, we went back for a mommy cuddle. Got there just in time for his diaper change. Gaye, his nurse for the day, proudly announced that his balls had dropped. Now, among the things I never thought I needed to think about, balls dropping would have been high on the list. Apparently this is not something that happens till the fetus is much more developed and surgery is sometimes needed. Lucky for us Sam took care of this on his own. Once he was all cleaned up, we got ready for our cuddle. This time, as opposed to Sam’s nurse getting him out and handing him to me, Gaye taught me how to pick him up! So, for the first time, I got my son out of his bed, placed him on my chest and sat down in the chair for some cuddles. 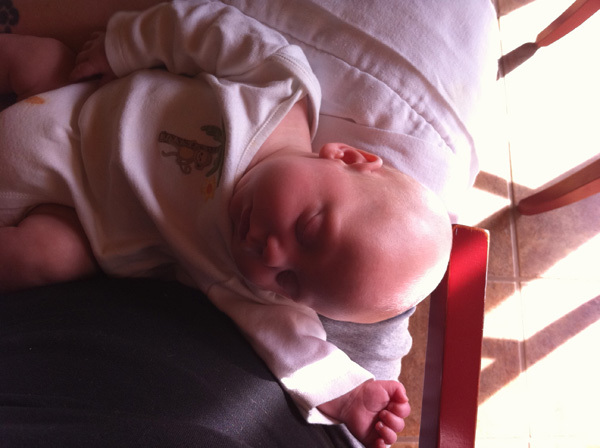 It was so empowering to be the one to take him out- almost like I was his mom! We had a great cuddle (aside from the sweat that was pouring down me). While he was snuggled up, Sam opened his left eye just a little for us. It was amazing to see him with his eye open, and I can’t wait to see both of his eyes wide open taking in the big bad world around him. 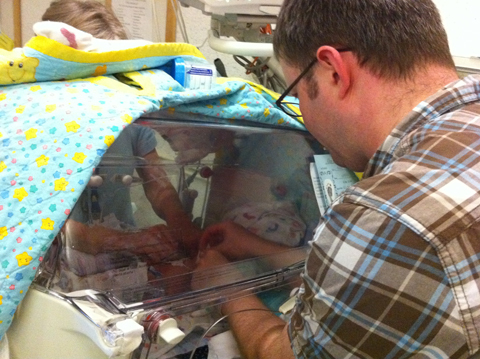 After 1.5 hours, I got to put him back in his incubator. Again, such an empowering feeling to have that much responsibility for him. Once he was in, it was time for a diaper change. Again, Gaye asked if I wanted to do it and while I was thinking Peter chimed in with a YES! So, he got a lesson from Gaye and changed his son’s diaper. I wish I had gotten a better picture of the look on Peter’s face, but I can tell you this was the most memorable diaper change Peter will ever be a part of. We left feeling good about how he was doing. Fingers are crossed that he will continue to do well and not need to go back on the vent.